Ravana takes the fields against Lakshmana and Hanuman, detail of a page from the Mewar Ramayana, 1649–1653, by Sahiubdin (Indian, active 1625–1660). Opaque watercolors on paper. The British Library, Add. 15297(1) f.60or. Front cover of the exhibition catalogue. This winter, projects and holidays conspired to prevent me from catching the Asian’s current exhibition, The Rama Epic: Hero, Heroine, Ally, Foe until late in its run. Now there remains just a week left to see the show, and before I say anything else let me say that you should stop reading this and go catch it right now. The Rama Epic is a major exhibition that was organized by the Asian under the direction of Forrest McGill, Wattis Senior Curator of South and Southeast Asian Art at the museum, and it draws materials from a wide region. Included are 135 objects from India, Myanmar, Cambodia, Thailand, and Indonesia. The objects, of the highest quality and carefully chosen to highlight the exhibition narrative, were drawn from institutions including the Art Institute of Chicago, the Asia Society, the British Library and British Museum, the Brooklyn Museum, the Cleveland Museum of Art, the Harvard Art Museums, LACMA, the Met, the Guimet, MFA Boston, the Peabody Essex, the Philadelphia Museum of Art, Museum Rietberg Zurich, the San Diego Museum of Art, the Smithsonian, the V&A, and several others, in addition to the Asian’s own respected collections. This is an extraordinary gathering together of materials that must have been a formidable undertaking for the organizers. 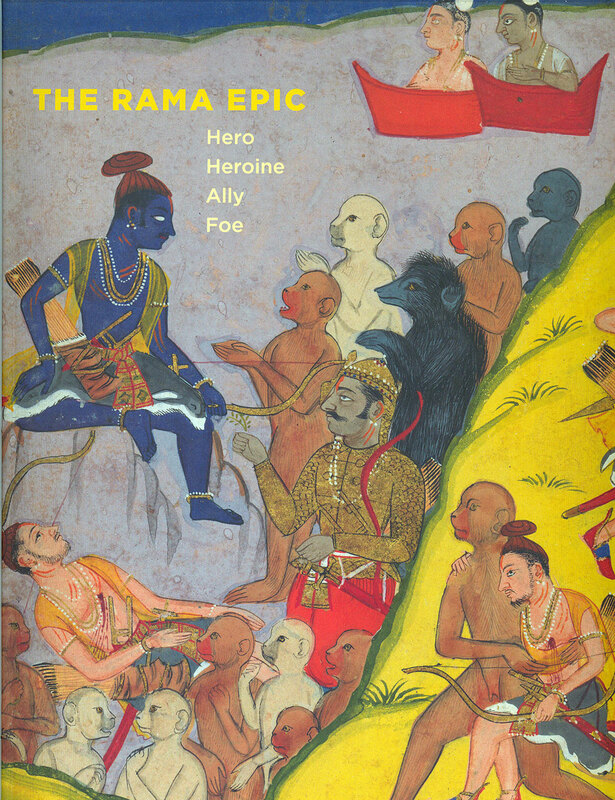 The Rama epic, best known in the West through the Ramayana of Valmiki, is of course, along with the Mahabharata, one of the key sources of narrative in South and Southeast Asia, not only (as the exhibition illustrates) for Hindus but also for Buddhists, Muslims, and others of the region’s peoples. (McGill compares it to the King Arthur stories; comparison could also be made to the Homeric epics and tales of the Bible.) As a result, many variations of the stories exist. The exhibition conveys the diversity of the Rama stories, as expressed in a wide range of places and times, while also distilling them down to their underlying essence. It does this by focusing on four key figures, presented as the Hero, the Heroine, the Ally, and the Foe. These are Rama, his wife Sita, the monkey warrior Hanuman, and the demon king Ravana. Through a succession of artworks arranged to highlight these four figures, the complexities and controversies of the epic emerge, while even visitors who are not much familiar with the stories gradually come to understand its essential structure. Reduced to bare bones, the story is this: Rama, an avatar of the Hindu deity Vishnu, is born a prince of an Indian kingdom. His worthiness is evident and also proven by challenges, yet he is prevented from ascending to the kingship by palace intrigues. He meets and weds the faithful Sita. Always he is accompanied by his constant companion, his brother Lakshmana. Exiled from the city of his birth, Rama and his companions live for years in a forest wilderness. There a female demon attempts to seduce the brothers. Appalled by this prospect, Lakshmana hacks off her ears and nose, which must have done little to improve her presentability. She complains to her brother, the powerful demon Ravana, and things go downhill from there. Soon warfare engulfs everyone. Through trickery, Ravana succeeds in kidnapping Sita, and Rama must lead an army to find and recover her. Chief among his warriors is the bold and powerful Hanuman, who succeeds in locating the captive and who distinguishes himself in the ensuing battles. Eventually Rama kills Ravana, Sita is freed, and Rama is crowned king. But false rumors circulate that Sita might not have been faithful to Rama during her captivity. To prove her fidelity, she enters and emerges unscathed from a bonfire. In many versions of the story this dubiously happy ending settles matters, but in others Sita’s trial by fire still does not satisfy some of the kingdom’s malicious gossips, and Rama, putting good governance over his own feelings for Sita, sends her packing. After many years in exile, she is returned, only to be asked once again to submit to the fiery proof. But by this time she has finally had enough. Calling on her mother, the goddess of the earth, as a witness, she is swallowed into a great opening in the ground—whose fault was that?—and she disappears forever. In this bittersweet version of the ending, Rama then abandons his earthly form and ascends to the heavens. In many ways it is a story of bonds and fractures. Constancy and inconstancy are the, well, constant themes. Some works that highlight these motifs can give a sense of the content of the exhibition (though the diversity of works is far greater than I can show here). The invisible Indrajit fires arrows at Rama and his allies; end panel from a box (detail), ca. 1500–1600. Sri Lanka. Ivory. Virginia Museum of Fine Arts, Friends of Indian Art and the Robert A. and Ruth W. Fisher Fund, 2004.16. Among the bonds is the constant friendship of Rama and his brother Lakshmana. Lakshmana never wavers in his support of Rama, and the two experience many adventures together. 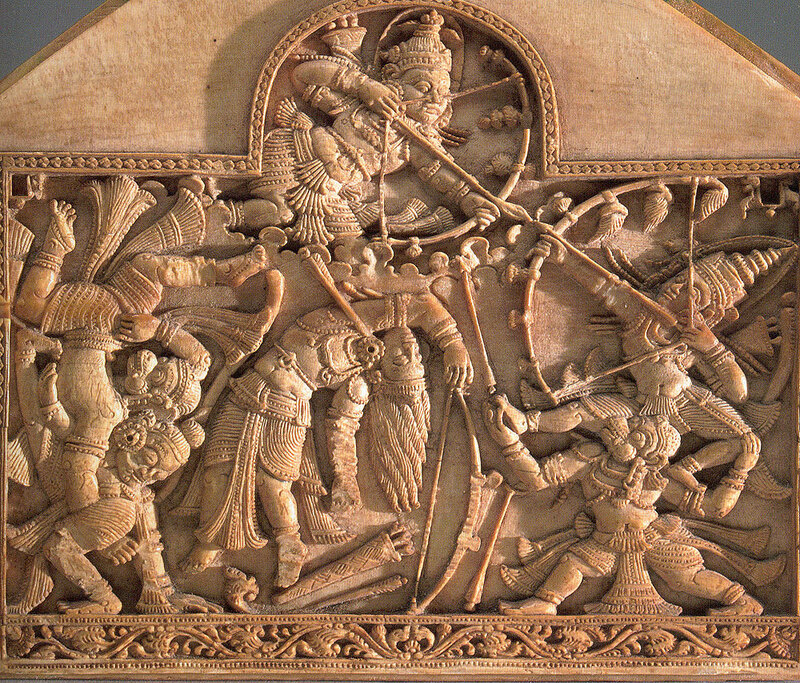 This sixteenth-century ivory relief from Sri Lanka depicts the brothers’ falling victim to arrows fired by Ravana’s faithful son Indrajit, who has become invisible. Hanuman returns with medicinal plants, 1775–1780. India; Himachal Pradesh state, former kingdom of Guler. Opaque watercolors and gold on paper. Museum Rietberg Zurich, collection of Eva and Konrad Seitz, B40. Hanuman is equally constant. After the brothers are grievously injured by Indrajit, Hanuman brings healing herbs from the Himalayas to revive them. 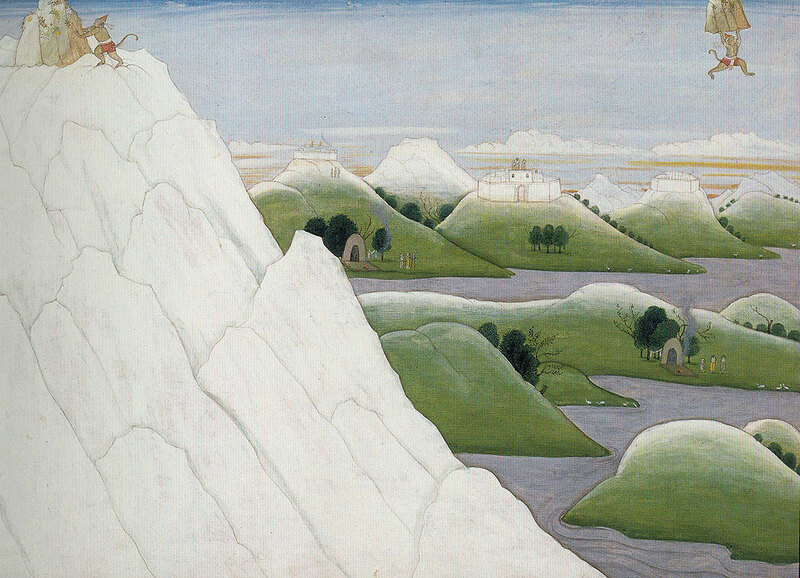 Unsure which herbs would work best, he carries back the entire mountaintop, as shown in this eighteenth-century painting from northern India. The demon giant Kumbhakama battles Rama’s armies of monkeys and bears, ca. 1605. India; possibly Madhya Pradesh state, former kingdom of Datia. Opaque watercolors and gold on paper. Asian Art Museum, gift of the Connoisseurs’ Council with additional funding from Fred M. and Nancy Livingston Levin, the Shenson Foundation, in memory of A. Jess Shenson, 2003. 3. Constancy also features on the demonic side of the conflict. Ravana’s giant brother, Kumbhakarna, is something of a comic figure, but a complex one. Despite disapproving of Ravana’s actions, he feels obligated by fraternal bonds to fight on Ravana’s behalf. 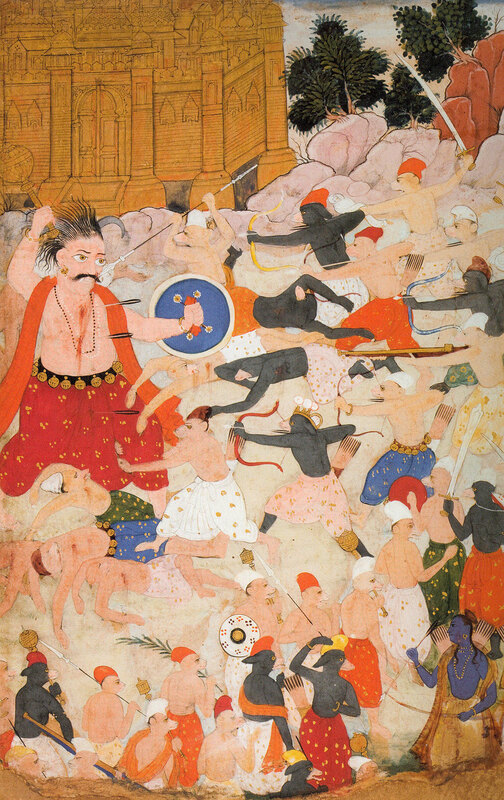 Here, in a seventeenth-century Indian painting, he battles an army of monkeys and bears, allies of Rama. Mourning for the death of Ravana, and preparations for his funeral, from the Mewar Ramayana, 1649–1653, by Sahibdin (Indian, active ca. 1625–1660). Opaque watercolors on paper. The British Library, Add. 15297(1) f.173r. Kumbhakarna’s decision to battle to the death for Ravana is contrasted with the path taken by another of his brothers, Vibhishana. Like Kumbhakarna, Vibhishana was outspoken in criticizing Ravana. Unlike him, he goes over to the enemy and fights alongside Rama. What does fidelity mean in this case? By being true to his beliefs is he untrue to his brothers? 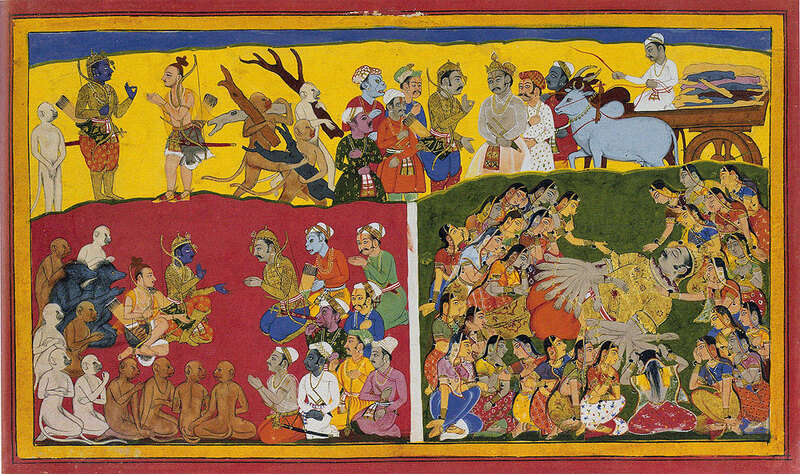 In the lower left of this seventeenth-century painting depicting mourning for the death of Ravana, Vibhishana— who has refused to carry out traditional funeral rites, arguing that Ravana was cruel and despotic—is upbraided by Rama, who says that Ravana was nonetheless heroic in battle. Sita’s trial by fire, ca. 1940, by Jamini Roy (Indian, 1887–1972) or workshop. Opaque watercolors on cardboard. Victoria and Albert Museum, London, Given by Mr. J. C. Irwin, IS.49-1979. Many more instances of fidelity and infidelity appear in the epic. A Structuralist critic could have a field day diagramming all the binary oppositions. But the core case is that of Rama and Sita. Sita remained faithful throughout her long captivity, despite Ravana’s pressures. Yet Rama appears to treat her as if she had been sullied, despite never believing this had happened. Many will feel that Sita—“an abused wife and yet a feminist heroine,” according to Sally J. Sutherland Goldman in the exhibition catalogue—has been treated unfairly. 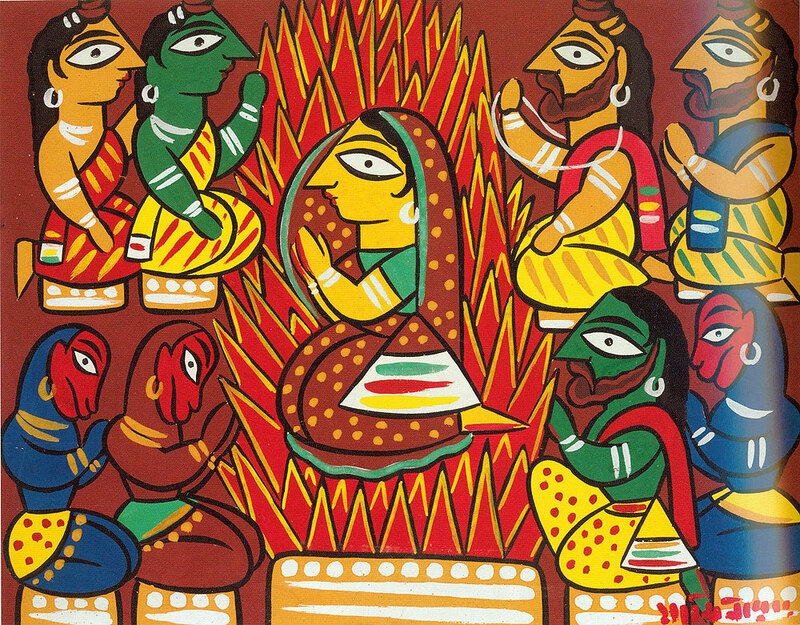 In this 1940 painting by the modernist Indian painter Jamini Roy (or his workshop), Sita sits enigmatically amid the flames during her trial by fire. Sita, ca. 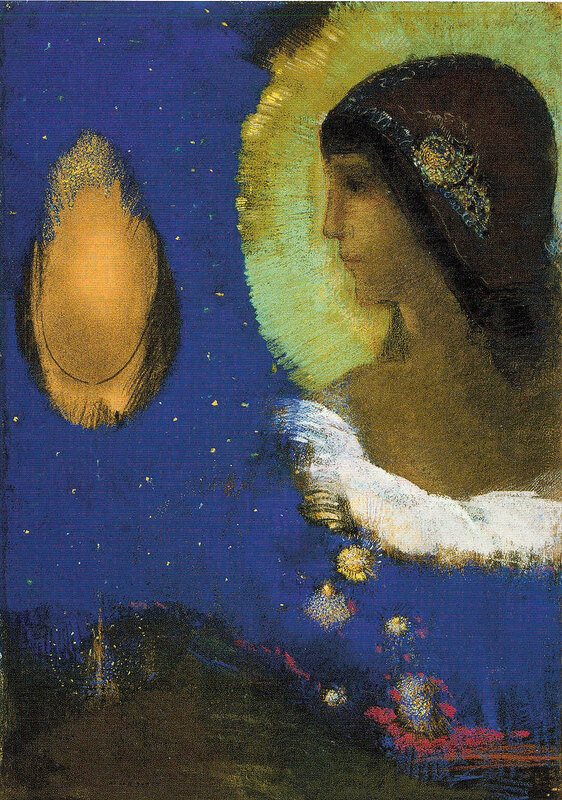 1893, by Odilon Redon (French, 1840–1916). Pastel, conté crayon, and charcoal on paper. The Art Institute of Chicago, Joseph Winterbotham Collection, 1954.320. Moral dilemmas abound in the Rama stories, and people have debated them for centuries. I have only been able to touch on a few here. I strongly urge anyone who can make it to go see this show, now in its final week, before its marvelous artworks return to their lenders or to storage. For those who can’t make it to the city this week, the exhibition catalogue (handsomely designed by Wilsted & Taylor) is organized along the same lines as the exhibition. It is a must-have for anyone with an interest in South or Southeast Asian art and culture.